I’m so passionate about everyone having basic cooking skills, and this begins in childhood. I know not everyone enjoys cooking or is interested enough to put their own spin on recipes etc. And I’m well aware that not everyone’s TV planner is filled up with cookery shows and their shelves are not (quite literally) collapsing under the weight of their cooking obsession! However, I do believe that basic cooking knowledge is an essential skill for any adult and that it’s important for everyone to have a go-to list of five to ten easy, from scratch recipes. I’m not going to pretend we don’t cheat in our house, we eat plenty of convenience food because it’s – well – convenient. But I make sure this is balanced out every week with several home-cooked meals too. This is a passion, or at the very least a basic skill, I hope to pass on to Caterpillar. He has always been curious about food preparation and as a young toddler I would pull his high chair close to the worktop and provide a running commentary to my cooking to keep him occupied (and to practice my own future Food Network show of course ha ha!). As his motor skills developed he began helping out with basic cooking and particularly baking, which all children seem to love – perhaps more for the end product that the joy of it though! 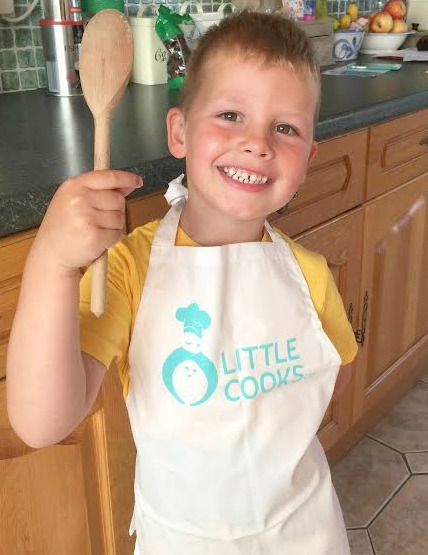 As he grows, I’m always looking for new ways to keep him engaged in cookery so when I heard about Little Cooks I was very happy to give it a try. Little Cooks is a monthly subscription service which provides glossy recipes cards and everything your child needs to create a healthy snack recipe, including all the dry ingredients. 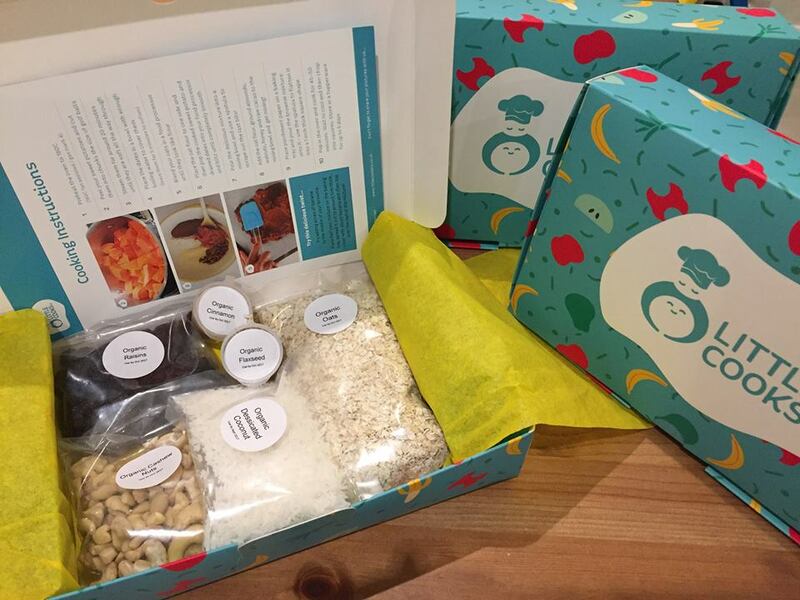 The company is founded by two mums with a real passion for both cooking and nutrition and this shows in their kits. Ever since receiving our box, Caterpillar has been keen to get started, which makes my heart so happy. We loved the clear, bright instructions and information. 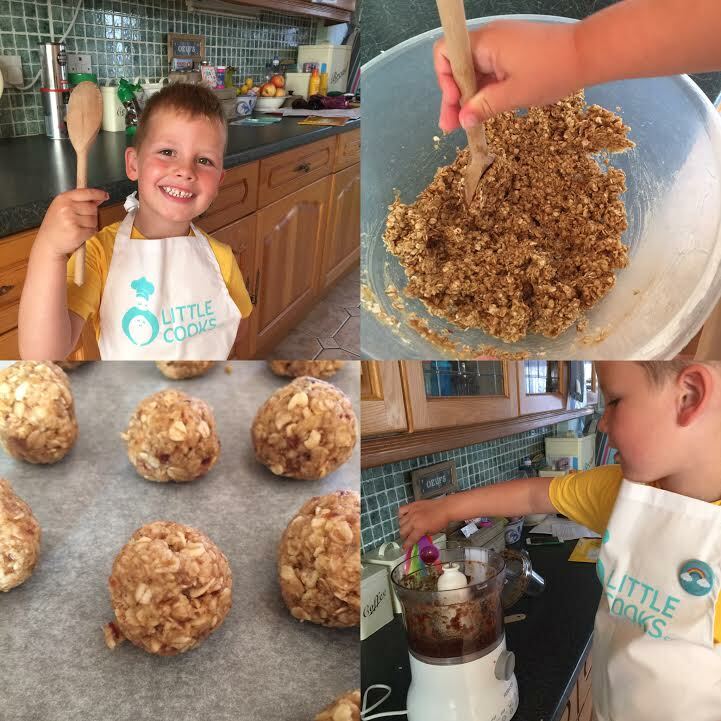 The snack recipe we tried out is the Banana Flapjack Balls which were a huge hit with both my son and my husband and we now plan on trying the others too. Really good quality. 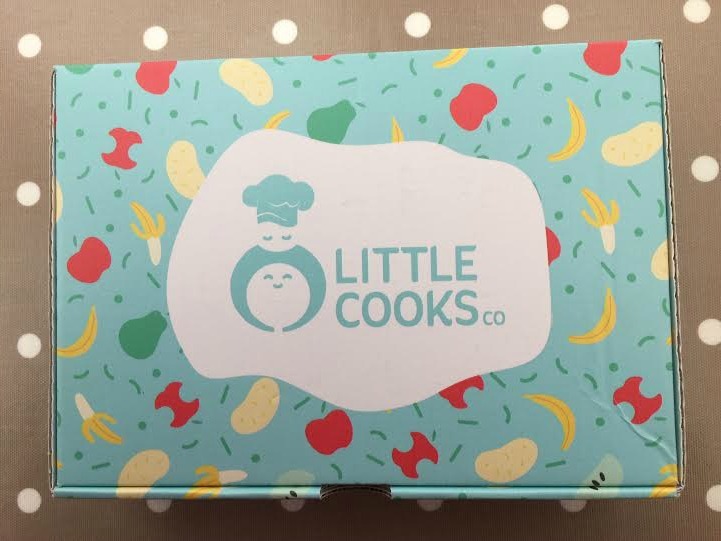 Some subscription boxes I’ve seen can be a little lacking in quality and continuity but Little Cooks has both. Healthy recipes with all natural ingredients. Since Caterpillar discovered refined sugar a year or two ago, encouraging him back to the natural, healthy food he lived on when he was first weaned has proved a little tricky. Making this Little Cooks recipe helped a lot! He usually makes a fuss about anything containing oats or dried fruits but he loves these and I didn’t mind if he ate one too many as I know there is no sugar, golden syrip or “bad” fats in there (they are made from oats and coconut milk, and the sweetness comes simply from dates, banana and vanilla). Interaction. I’ve written before how I’m not really a natural at certain types of play and much prefer reading, cooking or crafting with Caterpillar. These kits are ideal for this and we both enjoyed the quality time Little Cooks provided us. It’s always a lovely parent/child bonding experience to do something together you both enjoy. So if you’re the type of parent who is more into baking than blocks this could be for you. It kept him occupied. Let’s be honest, filling the days when you have little ones can be challenging enough and I’m always looking for new activities to keep the whining and boredom at bay. Discourages fussyness. I thought I’d dodged the fussyness bullet via baby-led weaning when Caterpillar was about 18 months old. Sadly, he hit the ‘terrible twos’ and began questioning his food a bit more. This didn’t last too long but sometimes we still experience some drama at mealtimes and I think having your child help with the cooking really encourages them to try new flavours with less fuss. A perfect gift. It’s sometimes hard to think of a good birthday gift for kids who appear to already have every action figure invented but a Little Cooks box would be a really unique, alternative present. The price. Each box is only £7.99 but if you use the discount code BOX1 you can get your first box for only £5.99. Would you like to try Little Cooks out for yourself? Enter below for a chance to win a three-month subscription. Or for more information visit www.littlecooksco.co.uk. Disclosure: This is a collaborative post, words and opinions are all my own. Please note that box contents may vary, check website for full details of current box. Previous Previous post: Book Review: My Tail’s Not Tired! We most like to bake simple things like flapjacks and cupcakes. Once the children have gained confidence and a few basic skills, we move on from sweet things to savoury. My kids like to bake muffins with me – the are so easy to make. I think these look great my little one would love this. We like to make chocolate crispy cakes and flapjacks. We like to cook mini cheese scones – they are super easy and make a great snack. Cupcakes are our favourite thing to make. My favourite thing to make with my son is cupcakes! I’m not a huge fan of being in the kitchen but have slowly started to enjoy it more since weaning my son. How young were yours when they started joining in? WE love making cupcakes, lots of different flavours, Ellie is becoming quite the professional in the decorating department! Love this. I plan to start introducing my kids to cooking and more kitchen stuff when they are 5. Do you think that is too late? At the moment I only cook cakes with my Granddaughter but would to get her into trying different things. I saw you tweeting about blogging and I thought I’d check out your website. I really like it. Looks like Laura has come a long way! That sounds like such a great way to get younger children into the kitchen. BattleKid doesn’t help too often but when he does he really enjoys it! The Little Cook Boxes look fab and love the fact that they use healthy ingredients. These look great fun and healthy too. It’s good to get new ideas as I tend to get stuck in a routine, baking the same things with my little boy. I stopped baking just after I gave birth to my daughter. She’s just about to turn 7. I haven’t made many things with her. This looks like a great way to get back into it and include her every step of the way. My daughter and I love to bake together, usually brownies so this would be something different and fun that I know we’d enjoy together. Get the children cooking so the adults don’t have to! At the moment, we are enjoying making courgette chocolate cake as we have a glut of courgettes. These look so good to make with the kids on days in, beats boring old crispy cakes. Butter biscuits are a firm fave in our house! This looks great and gets them helping to enjoy doing small tasks in the kitchen. What a fantastic idea, my kids all love cooking, so they would love this. I love making cookies and then decorating them with my children. Me and my little boy love to make cookies! These boxes look great, my son loves cooking but can be a bit of a fussy eater. I try to do more cooking with him so he can learn how to transform food and maybe try things he’s baked. My girls love helping me in the kitchen, they help with dinners mainly but we do love making our own bread, the messy kneading is such fun!! We love making FAIRY cakes and decorating them, in fact we are going to make some this afternoon! These look great. I have a 2 year old who is already interested in food and loves learning about fruits and vegetables at the moment so I’ve started letting me help prepare them for mealtimes. I’m really loving this age and cooking together is a really nice bonding experience. We love cooking homemade pizzas together. We like making flapjacks, pancakes and pizzas together. Cupcakes and chocolate shortbread, my little girl loves licking the bowl after.